This variety was given to me by a friend who had saved the seed. It is a very slender, corkscrew shaped pepper, sweet and fairly spicy like a cayenne. Since the variety was a hybrid originally, I can't be sure it is completely stable. However, the ones I grew this summer looked just like the F1 strain. 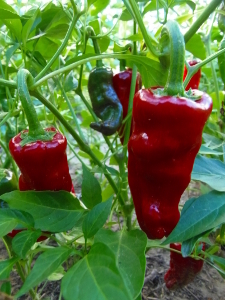 It is worth a try, I think, because of the distinctive shape and makes a fine market pepper. It dries easily and the chili powder I made has a smoky, fruity flavor that is quite good. The photo shows the green fruit, - it turns a brilliant crimson when ripe.